A simple addon so you don't have to dig into the quick slot interface during combat. Probably more useful, is that you can also set up hotkeys (from the Escape menu -> Controls) and press the hotkey to set that item as the current quick slot item and then use it (default: Q). Move the expanded quick slot bar by clicking and dragging the area around the quick slot items. Themed to match ability bar. Turn on/off the expanded quick slot bar display (hotkeys will continue to work). Turn on/off auto-hide feature when in UI mode. Turn on/off auto-hide feature when in combat. Turn on/off key bind display and set position (horizontal and vertical) relative to quick slot items. Turn on/off item quantity display and set position (horizontal and vertical) relative to quick slot items. Turn on/off show warning and error visual cues based on item count. Turn on/off smart visual cues that show only when there is something to report. Turn on/off the numbers 1 through 8 displayed for each quick slot item. Turn on/off quick slot item background. Turn on/off base background around quick slot items. Can resize expanded bar to display as grids or purely vertical/horizontal strips (default). This also lets you only show a limited number of quick slots if you so desire. Keybinds to move to previous item or next item. Intelligently skips empty slots. Shows currently selected quick slot item with a colored label and all others with some translucency. Can adjust the size of the quick slot items. Turn on/off lock UI mode to prevent resizing or moving. Can force quick bar to show via a hotkey. This overrides all your other settings until its turned off by pressing the key again. Color indicator for quantity label and key bind label if item quantity is 0. Can disable default quick slot action button provided by the game. Can control the opacity/translucency of slot items that are not currently selected. Settings saved across all your characters. Reset addon to default states. I am constantly updating the addon, so if you don't use Minion, make sure to favorite it or visit the comments area often to learn about the changes! User "Ivanwfr" has taken the initiative and helped me add certain features in v1.8! Big shoutout to him, and keep them coming sir ! Ability to set items and move items around using the expanded quick bar. Please send in any bugs, suggestions or comments via Curse's tools! Is there any way that you can make the addon bar be a 2 click operation. Click 1. Switch to the Item you want in the quick slot. Click 2. Use the item in the quick slot . that way it minimizes the time and you are just telling it to use the quck slot item and by passing ESO using items with scripts rule. The item icon is only showing for the active slot on the bar. 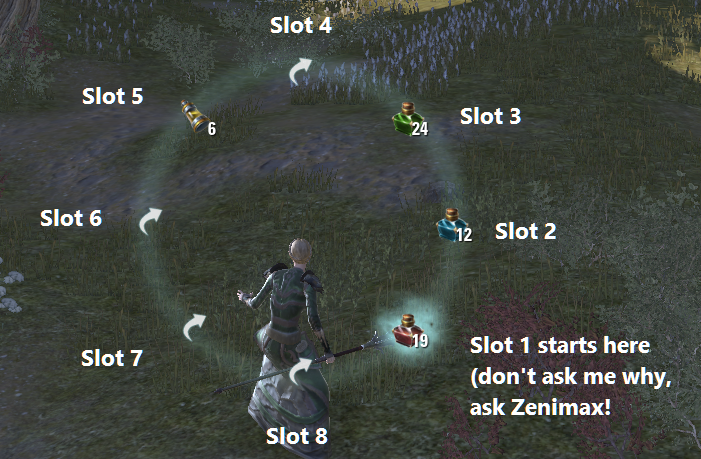 I have items in the first 4 slots and the only one displayed is the one I select using my hotkey. Is it because the addon isn't updated? Are they going to update this tool, i have been reading lots of great things?? I am having similar issues as Neutrinoh. I setup the controls for the new quick bar as shown in the pic above Binding using the F1-F11 keys. But when I am hitting F1 for my healing pots or any other F button nothing happens. I would really love to be able to use this. What are we doing wrong? To use magicka potion, you'd press F2 -> Q. Now to use health, F1 -> Q and so on. I love this additional bar, but would really love a key that actually uses the item in the quickslot. I've tried assigning various keys and they all do the same thing: the quickslot key-label turns green, and that's it. I'm still left pressing Q and dealing with that abominable Wheel of Stupidity. Am I doing something incorrectly? Or is this simply another shortcoming of the game itself (like that horrendous wheel)? Much thanks for this addition. Really nice addon - I hate having to cycle through the QuickSlot wheel thing. Would it be possible (probably in a different addon) to put your second ability bar (the one attached to your second weapon set) on the screen at the same time as the first one? Or possibly even just add more ability slots? Thanks for the comments, glad you find it useful. I can show it on screen, but we still cannot use it (ESO restrictions). Will add to ToDo list! Thanks for the feedback, glad you like it! Interesting idea on the bar that shows all things you have, or even just some hand-picked skills so its easier for you to switch. In fact, I can even have a hotkey for you to enable the switch (but only out of combat, ESO restrictions). Added to ToDo list! Think I forgot to reply here, but images were added shortly after your comment! Thanks for the feedback! Ok, I figured it out. When you turn the background off there's nothing left to drag it with, lol. Got it... thanks. Can you make it so the Auto Hide option works the other way round? It's just pointless to have quick slot bar visible when all other bars are hidden and vanish when you actually want it to show up in menus.